The tasks module represents a simple tasking system. Tasks related to a business or a project are automatically tied to a Project module entry. Plus, all of your employees will know what to do and when. Why should you use the Tasks module? Meet the core of the intercorporate and business communication. The Tasks module works as tasks management system, system of work approving, and as a system recording business communication. The module is also capable of recording minutes from meeting as well as sharing tasks between its users. You will never have to deal with pointless e-mails again. The Tasks module will be used by all of your employees. Normal workers will use it as a tool for successful task completion, sales managers to communicate with a client, and seniors as a tool to track tasks’ resolution. Thanks to the Tasks module, your company will run like a clockwork. All of your employees will know, thanks to the Tasks module, which task to do and when. For each day, they will have their tasks organized on a dashboard. Your employees can, of course, request for a feedback, put a task on hold or place it into a special queue, where tasks are waiting for a client’s reaction. Having a task disappeared from sight won’t trouble you anymore. 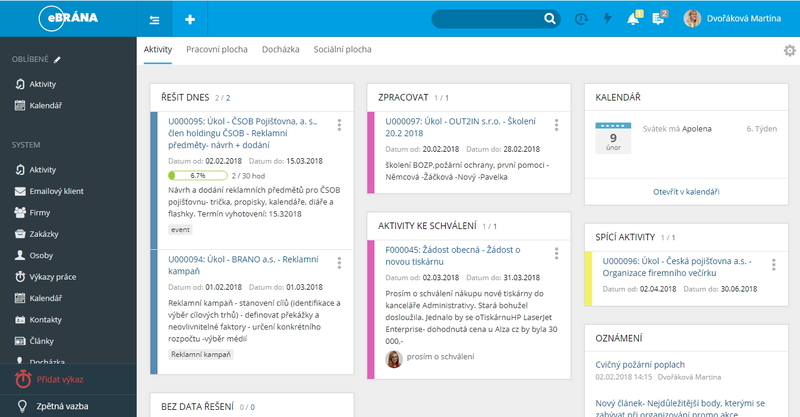 Senior employees are able to track all of the tasks’ movement within their department. The process of approving might be, in some companies, rigid. Speed the process up by extending the Tasks modules to requests. The task will be sent to those, whose approval you need, so you will see who approved of the request and on who’s approval are you still waiting. This process is used to approve of vacancies, demands, invoices, etc. Are your employees using colourful little paper squares to note important tasks? This kind of “system” will be gone. 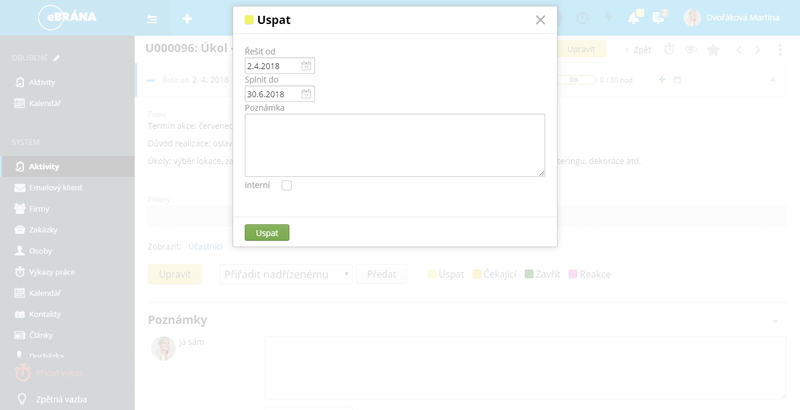 The Tasks module have an automatic notification system, just set the date and the Task will pop up when needed. Tasks also have an “assistant” who bears all the information related to a task. It also bears helpful tutorials and articles. This knowledge base may be extended, renewed and used to spread your know-how and discuss it. Potential represents your service or a product. 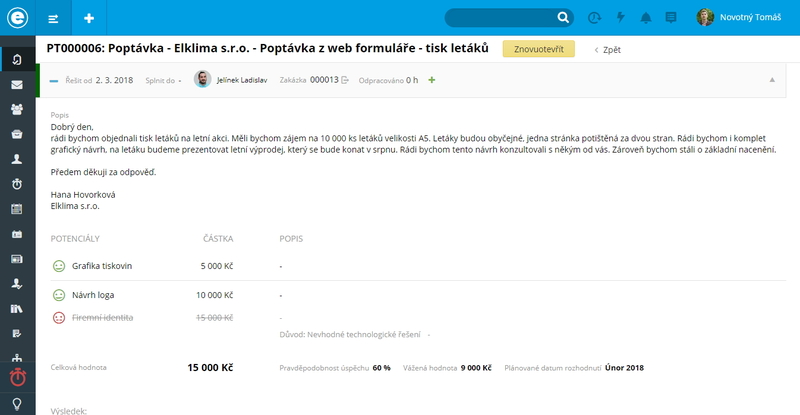 Potentials are helpful for sales managers, who can use them in communication with a client. Thanks to potentials, your sales managers will always know the value of a service or product, so they can ask an accurate price for an item. Business Tasks, from demand, through meeting to an offer contain not only potentials, but also e-mail communication. Business tasks, for sales managers, are a real ease off in administrative works. These tasks also serve as an overview of the amount of work done for a client as well as profits connected to a task. The Timesheets module is used to monitor the amount of time worked on a specific task, thus will help you with your time-management. The module also allows you to see the progress of an employee. Add a meeting or an event to your work in the Calendar module. 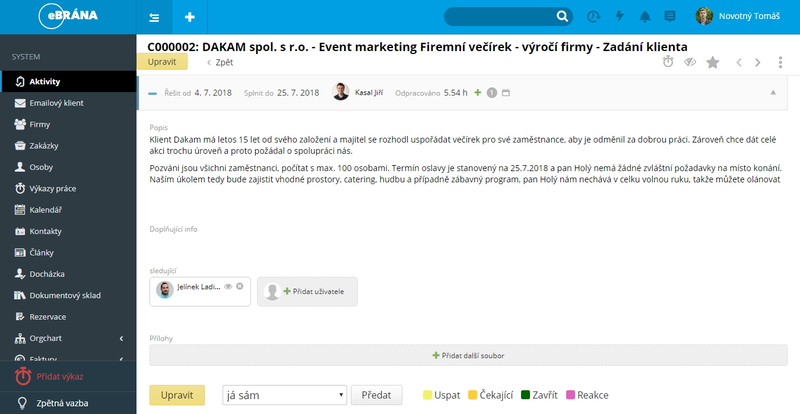 The module also works as a tool to send invitations to your colleagues and share, whether you are in your office or on a meeting. The Projects module contains business cases with recorded communication. Value them and monitor their costs and profits. The module has an evaluative function, in addition to monitoring and saving communication with a client.